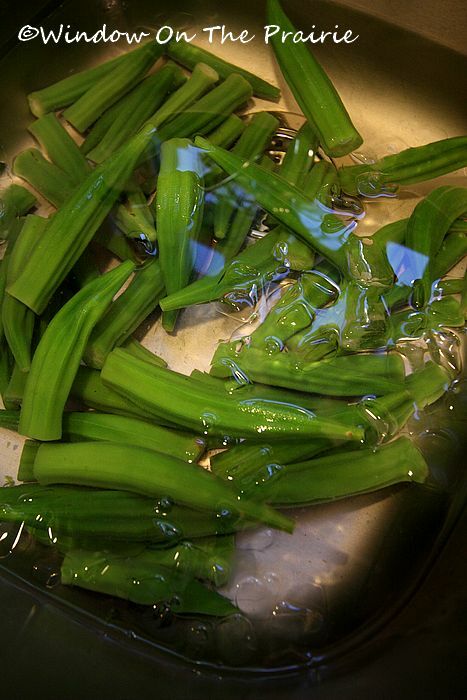 Right now we’re swimming in okra. It’s the only plant out of our garden that did really well this year in the heat and drought. We’ve had fried okra quite a few times, and I’ve given a lot of it away, but I got to thinking last week if it wasn’t possible to freeze it for later. So I looked it up, and sure enough, you can freeze okra. 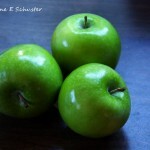 But first it has to be blanched to kill the bacteria. 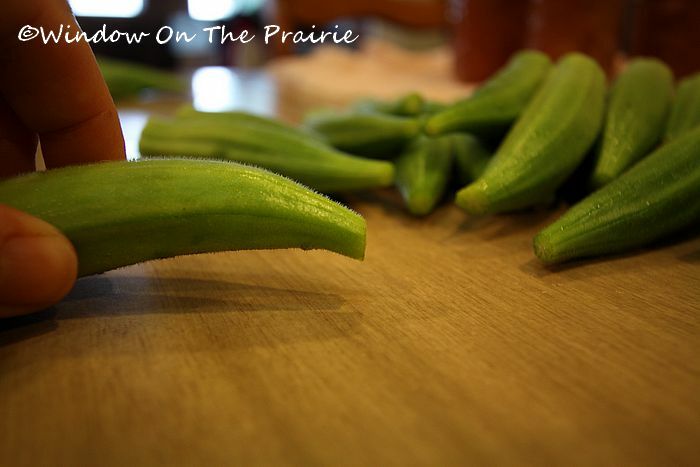 So, take your fresh okra, and wash it. 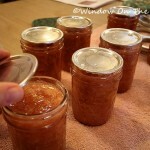 Then cut off the stems being careful not to cut into the cells where the seeds are. You can see I accidentally cut into a few of them. Then cut off the tips. 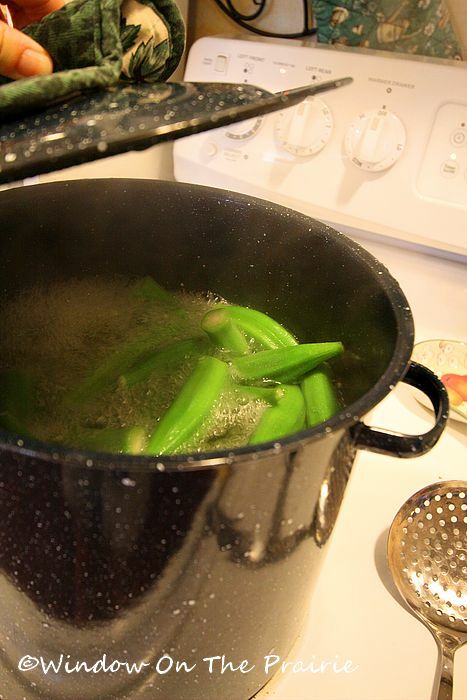 Bring a large pot of water to a rolling boil and then throw the okra in. Slap the lid on and boil for 3 minutes. Then remove from the boiling water and immediately place in ice-water. Leave in the ice-water until cold. Then place in freezer bags. I’m thinking about fried okra in January. Mmmmmm………..
Over the weekend, we received a total of 4 1/2 inches of rain! That’s more than we’ve received all summer, and the most rain we’ve received at one time since last fall. We went to the pasture yesterday, and lo and behold, the grass there was already growing, and just in time too as the cattle were down to eating slim pickins. The rain will also help out the soybeans which were wilting and starting to turn yellow. This rain was such a boon to everyone’s spirits. I’m so glad you received all that rain! I know you really needed it! Unfortunately, despite clouds and little spits of raindrops, all I got was less than 1/4 inch here in Overland Park, KS. Oh, how we need it! It misses us every time! I remember your okra post from last year…I said that I was going to try it. Do you think I did??? No! I didn’t. I did find it though, at our local fruit market. There is a little section there that has veggies from the Amish farms. But…..I didn’t buy it. I need to give okra a second chance. Ha! Maybe that should be on a t shirt. “Give okra a second chance”…haha! 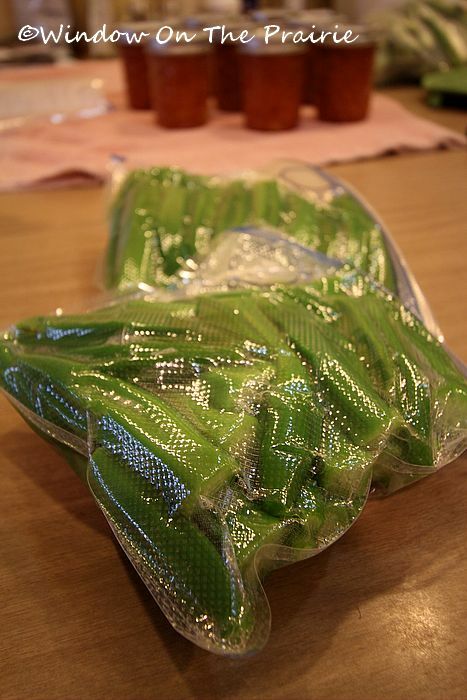 I only say this because of my first and last experience with okra…cause we cooked it improperly..slime fest! But…what I really need to do is come over to your house and taste your fried okra!! Then I will be a converted woman!! Suzanne, if you’re cooking fried okra I’m coming to your house for supper!!! I love that stuff and haven’t had home fried okra in way too long. The frozen stuff just doesn’t cut it, although I will eat it when I’m desperate. 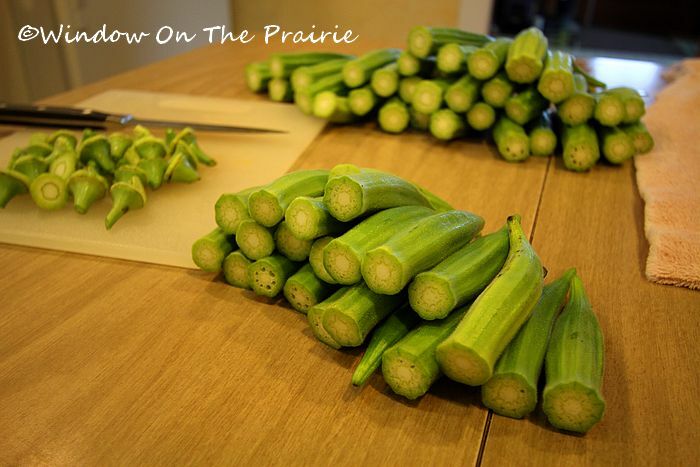 Okra thrives in that hot dry weather as you found out. We were making some changes to our garden this summer and I didn’t get to grow okra. .I have missed it, since we love okra fried and pickled!! I have had people tell me that they bread it and then freeze it on cookie sheets and repackage into smaller bags after flash freezing it!! 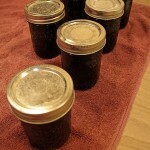 You’ll be so glad for your own homegrown stuff to fry in January!! My dad used to grow lots and lots of okra. Thanks for bringing back good memories. I need to tell my okra growing neighbor about this. She loves okra. I politely decline when she offers to share it. I like fried okra fine but that’s about it. Looks like you had a bumper crop! Yea for all the rain. We finally got some rain here in NE Oklahoma also. 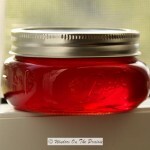 Looks like you put up some jam/jelly also! Glad you got rain. 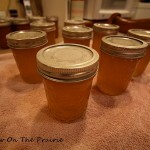 Here on the Phony Farm in TN I say “No more food preservation. Gaaa!.” Actually I am thankful we had a great garden this year. So happy that you finally got rain! Your okra looks much better than what I see in the supermarket. I love it fried. Oh. My. Goodness. Fried okra. I’m drooling. Your crop looks gorgeous! To those not familiar with it, there’s no other way to cook it but fried. And I’m happy to hear about all the rain you got. In my western suburb of Chicago, thankfully, we got maybe an inch. Closer to the city got up to 2 1/2″ with a lot of flash flooding. Okra is also great grilled and also in stewed tomatoes. Try it!